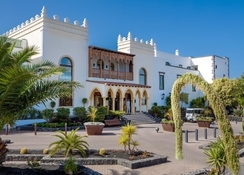 The luxurious Gran Castillo Tagoro Family & Fun in Playa Blanca Lanzarote offers the ultimate in 5-star pampering and relaxation, making it a perfect choice for both couples and families. 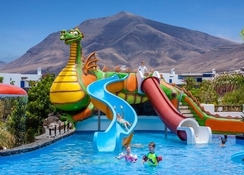 You'll be spoilt for choice with 11 swimming pools at this lavish Lanzarote resort and there is enough room around this sumptuous resort for families to have ample fun. Couples can also enjoy relaxing breaks and poolside cabanas. 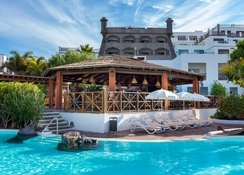 As the Gran Castillo Tagoro Family & Fun Playa Blanca Lanzarote is close to the breathtaking Papagayo beach, it boasts spectacular views of the ocean and the neighbouring Canary Islands, including Fuerteventura. There are 11 amazing pools to choose from and loads of on-site sports, entertainment and restaurants. What makes everyone happy is a top class spa, spacious comfy rooms, multi-cuisine restaurants and a 5D cinema. In the resort, sports and fitness lovers will be in their element, with countless fun activities to get stuck in to. The hotel’s design has the cool feel of an ancient castle, particularly the famous local castle - Castillo de San Jose. The hotel was formerly known as Dream Gran Castillo. 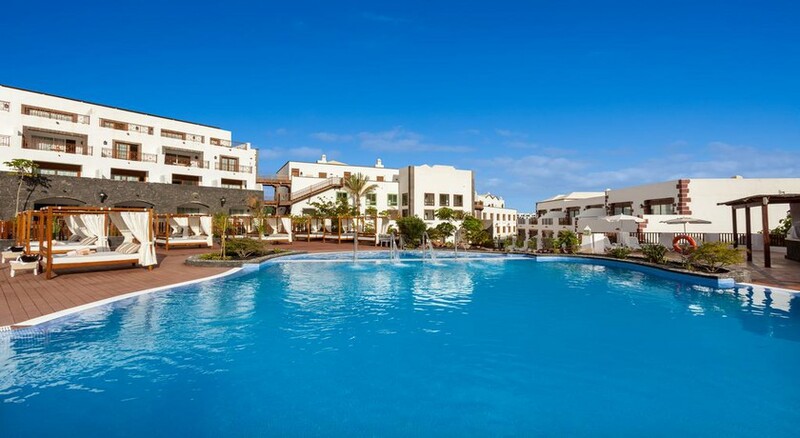 The Gran Castillo Tagoro Family & Fun is set on the beachfront in Playa Blanca in Lanzarote. 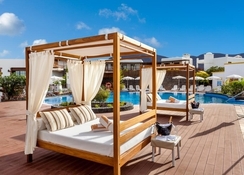 It is a perfect family holiday spot in Lanzarote. The Lanzarote Airport is the nearest airport, which is about 31 km away from the hotel. All the local attractions around the resort are just a few minutes away. The beach of Papagayo is a few minutes away, the Marina Rubicon, Cafe Terraza or Blu Note Lanzarote are also nearby. Additionally, a 10-minute walk from the hotel is the centre of the Las Coloradas Marina. The Gran Castillo Tagoro Family & Fun features 329 spacious, comfortable superior rooms and suites. Premium levels of comfort await guests in each room or suite with stylish décor that gives a calm and refreshing feeling. All the rooms come with beautiful views of the sea, neighbouring islands and the picturesque countryside. The rooms offer all the home comforts you need for a wonderful stay, including a private bathroom with bath tub, free Wi-Fi, satellite television, air conditioning, mini bar, a safe and much more. From local Canarian cuisine to celebrated Spanish specialties and menus inspired by countries all over the world, in Gran Tagoro Castle you will have an endless number of local and international flavours to explore. Las Coloradas and Portofino restaurants offer buffet style breakfast, lunch and dinner, whereas, Guang Zhou restaurant serves authentic Asian cuisine. Additionally, there are bars serving sparkling drinks, both alcoholic and non-alcoholic. At Gran Castillo Togoro, you have up to 11 fantastic salt water pools, open 365 days a year. The hotel has a huge space for fitness and sports lovers alike, with gardens to get active in and a gym for you to continue your fitness regime. Rejuvenate yourself at the Vitanova Spa, or enjoy the 5D cinema at the cinema hall in the hotel, the choice is yours! For kids, there is a Castleland, which features a great playground, slides, restaurant for the kids and more. There’s an adult zone that offers guests a peaceful and quiet retreat. Excellent in every way, definitely would stay here again. A lot of choice in activities and fabulous food and drinks on offer. I loved every minute of this holiday the staff were lovely from the reception to the cleaners all very polite and could not have been more helpful. The food was amazing plenty of choice and not repetitive at all. The main restaurant was busy and most of the children were in there but there is a lovely adults only area just off the main restaurant and nobody had to queue. The facilities for children are excellent and the adults only area by the spa was a lovely tranquil area if you got tired of the happy yells of the children. I would happily return to this hotel it was the best holiday in a while and the first time (but not the last) I had been to Lanzarote. Amazing family friendly hotel with added luxury. The baby crèche and kids club are great and allowed my husband and I some luxury adult time. Beautiful food. Absolutely fabulous would definitely recommend and will definitely go again. Nice hotel, great for kids with lovely food.